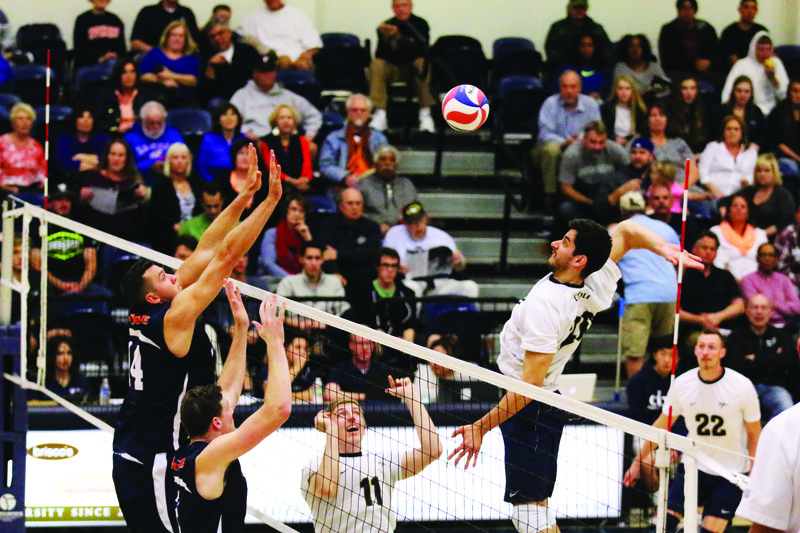 Coming from other schools and even all around the world, student-athletes arrive at California Baptist University ready to play their sport, but each goes through an adjustment period as they learn to rely on teammates and the community. For some of CBU’s new athletes, transferring just in time for a new season was an opportunity for redemption, and for others it has been a chance to grow more in skill. Thinking that his volleyball career was coming to an end, Jackson Carr, junior English major and setter for the men’s volleyball team, said he was thankful when Wes Schneider, head coach for the men’s volleyball team, reached out to him to play the 2015 season. Previously at George Mason University, Carr has already noticed differences between the two universities, such as the team dynamic and the campus environment. “This team is very talented, and it is good to be a part of it,” Carr said. As for the campus environment, he said he enjoys CBU more than he thought he would. Eividas Petrulis, master’s of business administration student and a forward for the men’s basketball team, came to the United States from Lithuania. However, he had experience playing in the U.S. before CBU’s 2014-2015 basketball season. In playing three full seasons at St. Mary’s College of California, Petrulis was able to find success during his undergraduate career. Upon transferring to CBU to work on his graduate degree, he said he has been able to find his place on the team. “Back in Europe people stick to themselves, but here people are so friendly,” he said. Enrique de Diego Garcia, freshman business administration major and middle blocker for the men’s volleyball team, said he felt pure happiness when he arrived, but his nerves got the best of him the first week of school.